March 29 is Palm Sunday. The Second Lesson is Philippians 2:5-11. The photo attached to this devotion was taken last week from a hiking trail at Sabino Canyon in Tucson, Arizona. Once you begin to think of a cross as the sign of God’s presence in human nature it shows up in surprising places. 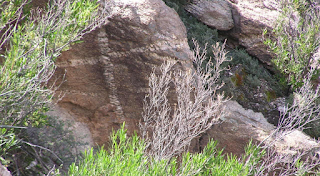 Even in the midst of a desert like Sabino Canyon, divine reality can appear in some startling ways. I don’t mind thinking about the cross. Holy Week is soon upon us, when it is clearly time to think about the cross as a way of life. What does it look like to be in the form of God while not exploiting life to our own advantage? How can we live more fully with others if we empty ourselves in service rather than control them for our own advantage? What does it mean to be obedient unto death, even death on a cross? In the next couple of weeks let us seek to understand. We may not grasp it fully, but no matter, as long as we dare to see the cross whenever it appears. I could have posted a lot of different pictures from my recent trip to Arizona. There is plenty to share with you about nature, Native American history, past and present immigration, contemporary living, artistic expression, and dreams for the future. I will share some of those in devotions yet to come. But, right now for me the cross is on my mind. Perhaps that is more relevant to all of life than we truly understand.